The blockbuster film Frozen is an American 3D computer animated musical and fantasy comedy film from 2013. Frozen is made by Walt Disney Animation Studios. 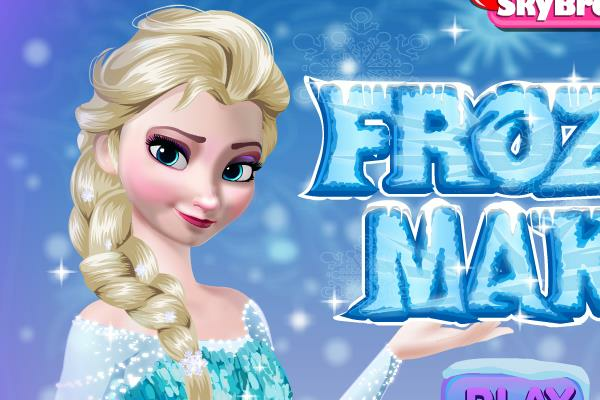 It is a wonderful movie and in this Frozen Dress Up Game and Makeover Game you will meet Elsa, the princess of Arendelle and do her make-up. This make-up game is inspired by various blue ice crystal's, just as it is in the movie. You will also need to help Elsa to find the perfect jewelry to go with her new makeover and outfit. Have you seen the movie? If you like this game you should also try this fun Disney Heroine Creator Girl Dress Up Game.